In less than two weeks I’ll be launching off on a two plus week ride to Minnesota and back that will cover more than 3500 miles. This is not a stunning mileage statistic by anyone’s calculation, but it will be the longest trip I have done – in 40 years. Preparations for this trip rely on the same methods I used back then. They’re not the methods many others use, and that is fine. If you’re contemplating such a ride perhaps my ideas will add to yours, or strengthen your resolve to maintain your differences! I’ve made this ride before. I rode from Minneapolis to Seattle and back on a Yamaha YDS 3 250cc two stroke motorcycle in 1968. This first adventure involved riding and camping with my friend Jim Niehaus, who had a Honda 305 Superhawk. 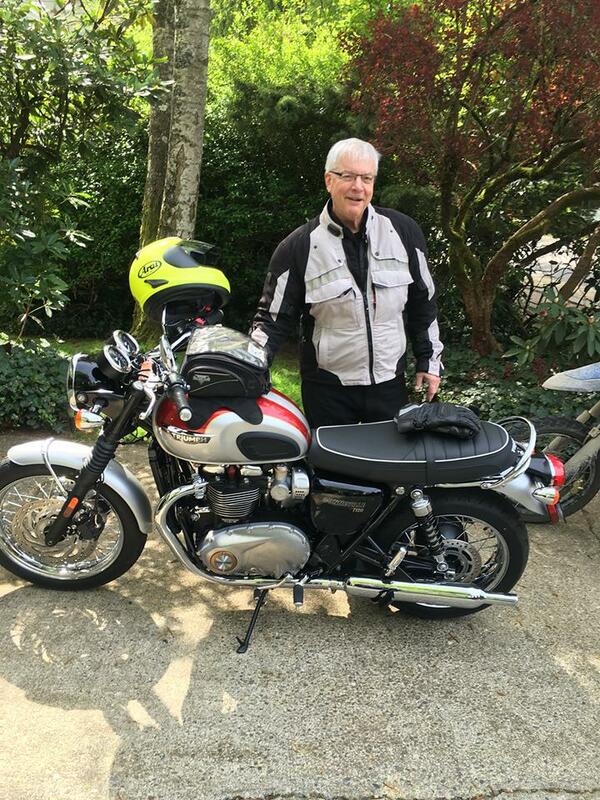 Oddly, we took exactly the same route to Seattle, and stayed at the same campgrounds, as did Robert Pirsig in his famous book Zen and the Art of Motorcycle Maintenance, but his trip took place in 1969, a year after ours. Having moved west the day after college graduation, (and wrecking my little Yamaha 3 days after arrival) I rode to Minnesota and back in 1970, once again camping. This time my ride was a Honda 450 Street Scrambler. In 1971 I rode on through Minnesota to Florida on the Honda. The plan was to ride both ways, but the Honda broke a timing chain and ate its engine in Florida. The remains were traded to a local dealer for a plane ticket home. I was in tears. It is very comfortable for me, although it shouldn’t be. 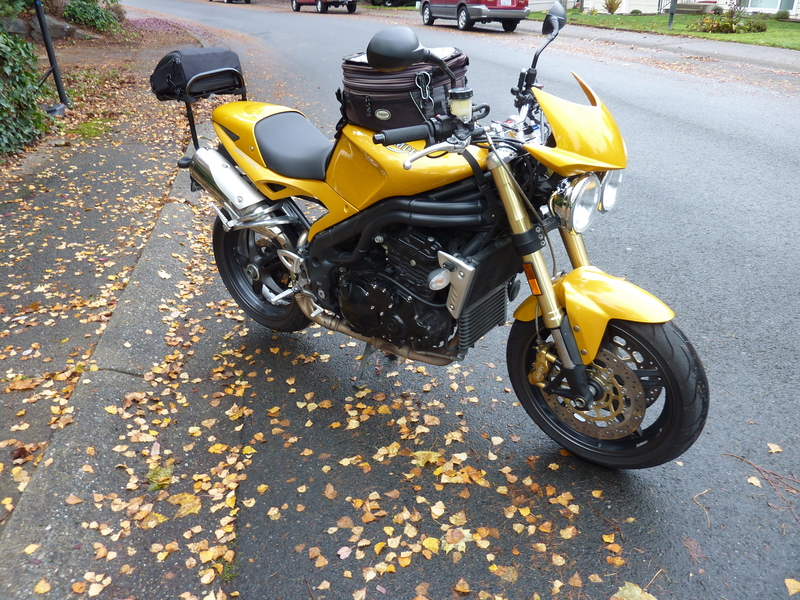 It will be the epitome of luxury, comfort, power, brakes, and handling compared to my previous “touring” bikes. I do not have a GPS machine on the bike, nor a “smart” phone. Nothing wrong with either (actually, there is a lot wrong with either, but I’ve written about that before): bottom line is that I do not like them. Changes from back then, in addition to three decades of improved motorcycle technology, are that I now have a cell phone, albeit a “dumb” version. I have a Ventura rack system for the Triumph that is far better than the surplus army ammo bags and such whatdoyahave stuff as we used back then. I now carry an air compressor, tire repair kit, and first aid kit – all of which I hope to not need. I am not planning to camp this time, preferring the convenience of motels, albeit modest ones. Perhaps most significantly, I have a charge card or two with limits much higher than my total income for the years 1968 to 1971 added together. Gear has changed radically. In 1970 the acronym ATTGATT (All The Gear, All The Time) was unknown. I wore a light blue ski parka, ski gloves, jeans, hiking books, and my beloved Bell 500 open face helmet with a bubble shield. In cold conditions I wrapped a bandana across my face just like Formula 1 drivers! If it rained I pulled on a flimsy two piece rain suit that might shred to pieces at any moment. Crash padding anywhere was non-existent. Now I venture forth in Vanson leather pants, Rev’ It boots, a Rev’It textile jacket, one of three pairs of gloves depending on temperature and potential rain, and an excellent Arai helmet with both tinted and clear visors available. I have crash padding at the knees, back, elbows, and shoulders, and multiple vents on the jacket and a liner offer the ability to adjust to both heat and cold. As to the rider, I’m a lot more careful of what I eat these days, and in every parameter but one I’m in better physical shape. But that one parameter is a big one. The passage of time cannot be willed away. The separated shoulder I suffered in 1969 in my only serious motorcycle crash (to date) does not bother me at all, but two operations on my right knee from basketball mishaps indicate less strength there. Last year, after about a dozen years of working out more regularly than I did when I was (ironically) coaching sports teams, I was stretching my knees one day and there was a moment when I could not remember which was the “bad one.” Huzzah! My hearing has faded over time, and the left ear is probably at less than 40% function. I should do something about that, but the inertia of working around the gradual loss for twenty years or so is hard to overcome. The most serious issue is that two years ago I evidently managed to tear two tendons in my left elbow (without knowing that I’d done so – weird) and I have occasional swelling in my elbow or wrist or hand on my “clutch” side. That could be a problem. As was my practice in the past I began thinking about this ride months in advance. I planned by first ride in 1968 for about 8 months, and started thinking about this one well before I retired at the end of October of 2013. Nobody needs this much time, including me, but I like immersing myself in the study of the intent and all of the myriad options. It is more like a hobby than actual effort, but makes the trip more enjoyable once begun. First I spend a lot of time mulling over a large atlas of state maps. I’m contemplating routes, changing routes, considering alternatives, measuring time and mileage, and etc. I then type up a route with expected destinations for each day, and then revise. Every few revisions I remember to alter the number of the saved “draft,” so the 3rd one that appears far below is probably more like the 6th or 7th. As an AAA member, a phone call got me very well done road maps of each state on my intended route, plus some accompanying “maybe” states. I’ll use these on the trip and leave the big atlas at home. At the same time, it’s important not to get hung up on a schedule, as this is supposed to be fun. If I find a hot rod show in a town – I will stop. Road construction can cause delays. I may want to just sit in a wayside park from time to time. On my ride to Florida by way of Minneapolis in 1971, I selected my route by gazing as far to the east as possible and selecting roads that appeared to meander around storm systems. Most of these routes used two lane highways, which I prefer, and my “system” got me all the way to Georgia before having to deal with rain. On this trip I’ve chosen an I-90 superslab straight shot route all the way to Hardin, Montana, and then I will get more “creative” after that. Who to take with you on a trip, and how many of them? On my 1971 trip I met up with a guy in Illinois I’d known in college but never ridden with. Bad mistake. My concept is to rise at dawn and be on the road by 6am or so. I also prefer to knock off early for the day, because I love to set up camp slowly and hang around in the evening. The other fellow was the opposite. He felt leaving before 9am was pointless, and that setting up a tent with a flashlight in utter darkness was as nature intended. After two of three days I wanted to kill him, and he probably did not think that highly of me. Lesson learned – if I want to have company, it needs to be someone I know well. It was only blind luck that made my first trip so pleasant, as Jim had similar ideas to mine. Traveling with one other person adds a sense of security and a helping hand when needed, does not slow the pace appreciably, and allows for sharing of motel rooms. Assuming the other person is male. I think I could share a room with any of my women friends who ride, but my wife is not comfortable with that, and her point of view is reasonable. This was not a problem 40 years ago because I did not know a single woman who rode. They were out there, but I did not know any. That was true, to be fair, of almost all sorts of women at that time. In my dozen years of experience in leading dealer customer groups, I found that if the group numbers more than two the pace will start to slow down, which may or may not be a problem, and if you have over 5 or 6 bikes you’ll average about 40 mph, no matter how fast you ride. Still, 10 hours at an average of 40mph is still a 400 mile day. Those numbers are for two lane twisty roads ridden with some pace, you can probably get close to a 50mph average if the group sticks to the Interstate. I was usually leading groups of 15 to 35, but only for one day rides most of the time. One person can lead a group of 20, but it is a little tricky! In any of the members of the group is a cigarette smoker, the pace will slow appreciably. Every time anyone stops for any reason, the smokers will light up. A 2 minute stop to remove a layer of gear will now take 25 minutes or so. For this one I chose to let fate decide. If people I knew wanted to go with me, that would be fine. If not, OK. I ended up with a compromise, although things may still change. My friend Deb intends to ride with me the first day, and then ride back to Seattle by a more creative route the second. So here there, is my intended route and my packing list. Again, this is not what everyone does, but it is what I like. Feel free to comment! Phone charger Motorcycle cleaning rags, etc. I’ll report back in August upon my return!